The Amazon Fire TV and Fire TV Stick have had the ability to shop Amazon.com products for some time, but the feature has been sitting dormant. A trusted source within Amazon, who wishes to remain anonymous, tells me a full-fledged shopping feature was nearly complete and ready to be tested in the wild, but Amazon CEO Jeff Bezos pulled the feature after receiving a demo. His biggest complaint was the limited shopping cart functionality. The Fire TV shopping feature demoed to Bezos allowed customers to either buy products immediately via Amazon’s 1-Click feature or add items to your Amazon shopping cart to then be purchased later through the Amazon.com website. Bezos insisted on the ability to manage your shopping cart and checkout on the Fire TV itself, so the shopping feature has been postponed. I’m told it’s not uncommon for a team within Amazon to work on something, get it mostly done, and then have the feature/project pulled or cancelled by Bezos. While the Fire TV’s full-fledged shopping feature likely won’t be released in time for the upcoming holiday shopping season, Amazon has started using parts of the shopping feature to allow Fire TV owners to buy select products through banner ads on the Fire TV’s home screen. Read on for a spotlight of this new limited shopping ability which gives us a good indication of what the full shopping experience will be like once it arrives on Fire TV devices. The Amazon Fire TV Stick has had a banner ad at the top of the home screen, added by the launch day software update, ever since it was released last November. The Fire TV gained the same banner add in February of this year. The banner only exists on the home screen and, up until now, has only advertised videos, apps, and games available through the Fire TV. Amazon has now started advertising products, like toys and tech gadgets, which can be purchased directly through the Fire TV and Fire TV Stick itself. Selecting the product banner ad either takes you to a small list of available products to purchase, like in the case of the “Holiday Toys” banner, or directly to the item information of a particular product, like in the case of the Fitbit or Halloween candy banner ad. The item information screen is quite fully featured and includes sections for product features, description, details, images, and even product reviews. The only thing really missing, that you would find on Amazon’s website, is Amazon’s “Customer Questions & Answers” section as well as additional buying options from the third-party sellers offering the same product. Product descriptions and details are limited to only text, so you won’t find any of the full page rich descriptions from the manufacturer like you sometimes see on Amazon’s website. 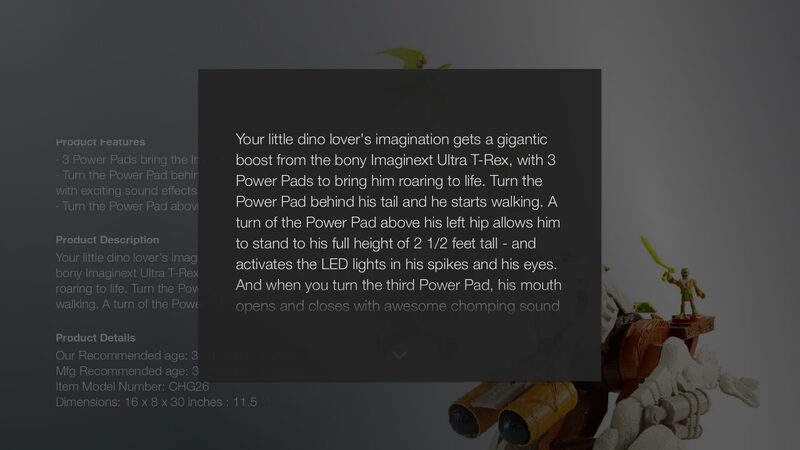 Descriptions larger than 4 lines of text will pop open the Fire TV’s default rectangular gray text viewer, like you find in the device’s help section. Past the product’s description and details is a horizontally scrolling image gallery similar to the ones you’ll find when viewing a Fire TV app’s details. Selecting an image thumbnail will, expectedly, display the image in fullscreen. If the product has a promotional video, as many products on Amazon are starting to include, you’ll find the video at the end of the image gallery. Product videos are played in fullscreen and can be paused, rewound, and fast forwarded like any other video on the Fire TV using the remote’s media buttons. At the bottom of the product screen is a breakdown of the product’s star ratings, as well as access to all the product’s customer reviews. Reviews are listed in Amazon’s default “most relevant” sorting order with no options to change the order. You can’t, for example, only view reviews with a particular star rating or sort reviews by “most helpful” as you can do on Amazon’s website. You do, however, have access to all reviews in their entirety, which is nice. Instead of just purchasing the item, you have the option to add it to your Amazon wish lists. Selecting the “Add to Wish List” button brings up a list of your Amazon wish lists to select from. There’s no way to remove the item from your wishlist,view items in a wishlist, or create a new wish list. If a product comes in various configurations or sizes, you can view them and select the options you want before purchasing. Selecting an option will change the products main image to reflect the selection when appropriate. Selecting the “Proceed to Checkout” button takes you to your order summary where you can change the shipping address, payment method, and shipping options. All addresses and payment methods saved in your Amazon account are available to select. Payment methods other than the one I have configured as my default method were marked in red with an alert icon. Changing my payment method to one of these alternate methods prompted me to re-enter my credit card number as a security verification measure. The shipping options available are the standard ones you would encounter when shopping on Amazon’s website. There are no options to add a new payment method or a new shipping address. If you want to ship to an address or pay with a method that is not already configured in your Amazon account, your only option is to select the “Add to cart and exit checkout” option found at the bottom of the shipping and payment screen. Selecting this option places the product in your Amazon cart and prompts you to “complete this purchase via a phone, tablet, or computer.” This aspect of the shopping experience, as well as the inability to purchase multiple items at once via a true shopping cart system, is likely what Jeff Bezos did not like about the current Fire TV shopping experience, causing him to postpone the full-fledged shopping feature. Selecting the large “Place your order” button, which is selected by default after entering the checkout process, executes the purchase in one step. In the case of a single product being advertised, like the Fitbit, Amazon Echo, and Halloween candy ads that I’ve seen, it takes only three button presses to purchase the item: one press to click on the banner, a second press to checkout, and a third press to place the order. Fire TV owners with kids, or technologically-challenged family members, will be happy to know that the Fire TV’s parental control option that requires a PIN to be entered before making a purchase has been extended to also include shopping purchases. The full-fledged Fire TV shopping feature still under development is expected to bring the ability to purchase nearly all products offered through Amazon.com. You’ll be able to browse products in various departments, apply filters and sorting options, as well as using the Fire TV’s voice-search functionality to more easily find what you’re looking for. While that feature has been sent back to the development team to gain a true shopping cart, the upcoming holiday shopping season is too enticing for Amazon not to use the already functioning aspects of the new shopping feature in a limited fashion. I’m sure my sweet tooth will appreciate Amazon’s decision when the candy I ordered, much too easily, arrives in a few days. I am so thankful that my Fire TV is rooted and never have to see this sickening Amazon UI mess unless wanting to access Amazon Prime Videos. Kodi is my home screen UI and utilizing the great customizable Titan skin makes for a great user experience. I don’t mind the banner too much though I’d rather it stay with just video/app content or amazon products. I think they had echo on one of the banners a while back. Full shopping will be cool but seeing a single product just makes wish full shopping was available now. If it’s something like fitbit or kids toys it doesn’t feel relevant to being promoted on fire tv. I agree. I don’t mind the banner, especially if it means Amazon can sell the Fire TV cheaper since their profit is supplemented by the banner. It’s not like not having it there makes the home screen more usable. My eyes navigate right to the recent list, since 99% of the time what I want is there, so I forgot the banner was even there. And thankfully pushing to the right selects the recent menu first, not the banner. Don’t you dare think about changing that Amazon! It always surprised me they haven’t launched a QVC-like shopping channel with in show buy button or Alexa voice option. the fire tv will be filled with ADs if they get this work. Saw this coming since after the gen 1 launch. They want a store in everyone’s livingroom. I find it intrusive. And if you want to shop from the couch just pick up your phone. Let them bring a better tv experience instead. I love my aftv but thats strictly limited to one product not the millions of products i have no use for. If Amazon has an additional revenue stream, which no one else can match, doesn’t it mean Amazon can offer can offer better value for hardware and more prime content ? I call that a competitive advantage. A competitive advantage sadly doesnt always translate into better products/services for the consumer. I think one of the major benefits of cord cutting is your not being bombarded by commercials/ads. But i was simply stating my opinion. And i am one of those people thatll pay more for quality or if i think it might make life better for some. That slippery slope is what ruined TV with ads taking up almost 1/3 of the time. I don’t mind having a convenient shopping portal. I don’t want my home screen populated with ads. In fact I don’t want any ads at all. Currently, they have a banner ad for their own stuff which I find annoying and would pay to get rid of. Another good reason to root… If that were still an option. Really hope they keep this separate from the the Video/Music section and allow you to opt out/turn off the “Shop” feature as I don’t want it on my TV. I don’t want to have to PIN my Video/Music just to lock the Shop. Hopefully I’ve got my Fire TV Stick setup properly to block the OS 5 update. Yesterday, my wife and I ordered some herpes cream off Amazon. Then we invited my in-laws over to watch our new Fire TV.